Trish has been a professional in the animal world for over 25 years. 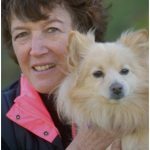 As Director of the Behavior & Training Department at the Marin Humane Society, she built a department known throughout the United States for its quality. Trish established the Canine Behavior Academy at MHS for new or interested trainers. She currently teaches the Academy of Dog Behavior, and teaches workshops and seminars on behavior, canine management, temperament assessment, and handling difficult dogs, among other topics. In addition, she and her partner own Canine Behavior Associates, consulting with and helping dogs and their owners. Trish authored a critically acclaimed book for dog owners, Parenting Your Dog (TFH Publications). She has written numerous articles about dog and cat behavior for local and national newspapers and magazines. She also developed the “Canine Calming Cap, “marketed by the Thundershirt Company, to help dogs that are overly anxious or excitable.